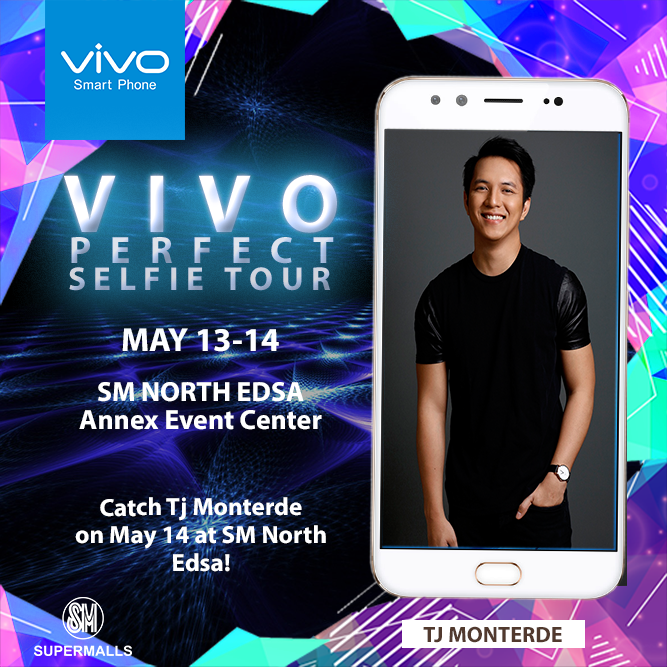 Vivo brings the perfect selfie experience to mall-goers in SM North Edsa, with acoustic balladeer, TJ Monterde ready to sweep everyone off their feet with his sweet songs. Catch the Vivo mall tour on May 13 to 14 at the Annex Event Center. 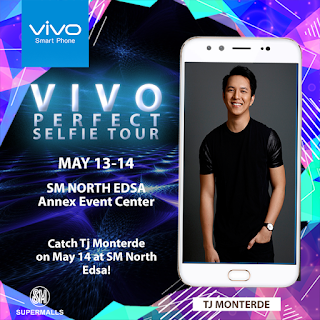 Songwriter and acoustic balladeer TJ Monterde is set to regale selfie enthusiasts on May 14 at the SM North Edsa Main Event Center—the third leg of top five global smartphone brand Vivo’s Mall Tour. Popularly known as soul supreme KZ Tandingan’s beau, Monterde is the voice behind hits like Dating Tayo, Tulad Mo, Sa Tuwina, and Ikaw at Ako—­sang with Tandingan. The nationwide mall tour kicked off at SM Bicutan and SM Megamall last May 7, drawing industry leaders, Vivo fans, and prospective consumers who got to know more about Vivo’s recently introduced ‘perfect selfie’ phones—the V5, V5 Plus and V5 Lite—and why these have totally won the hearts of Filipino selfie enthusiasts. To kick off the first leg of the mall tour, Vivo star Mccoy de Leon and Star Magic model-turned-actor Anjo Damiles provided entertainment fare. Raffles were likewise held in SM Megamall and SM Bicutan, which saw two lucky winners bringing home one brand-new Vivo V5 Plus each. Ten other audience members won assorted Vivo merchandise. According to Vivo Philippines, the four-month nationwide mall tour is geared to bring the brand—and its ‘perfect selfie phones’—closer to prospective customers in key cities in the country. Vivo excitedly revealed that it will also release the Vivo V5 Plus Limited Edition at some point during the mall tour, with specific details to be announced later. The V5 Plus, Vivo’s flagship phone that is touted to feature the world’s first 20-megapixel dual front camera, was launched early this year. It wields premium selfie features such as the bokeh effect, a tool that creatively blurs the background but keeps the subject in sharp focus; the face beauty mode 6.0, a ‘skincare’ tool that gets rid of unsightly blemishes and enhances the skin tone; and the selfie softlight, a front camera flash that allows users to take selfies even in poor lighting conditions. This May, Vivo is also set to visit SM Taytay, SM Sta. Mesa, and SM Masinag.